Comments made by Stand-Up Comedian Manoj who hails from Chennai on none other than Mahesh Babu are distasteful to say the least. He dared to describe Prince as the 'Male Version of Katrina Kaif'. He went on to say that the two rocks shown in the climax of 'Spyder' actually reflects him. On a sarcastic note, The Stand-up Comedian announced, 'Mahesh Babu Rocks'. He mentioned titles of few films of Mahesh Babu only to crack jokes on him. 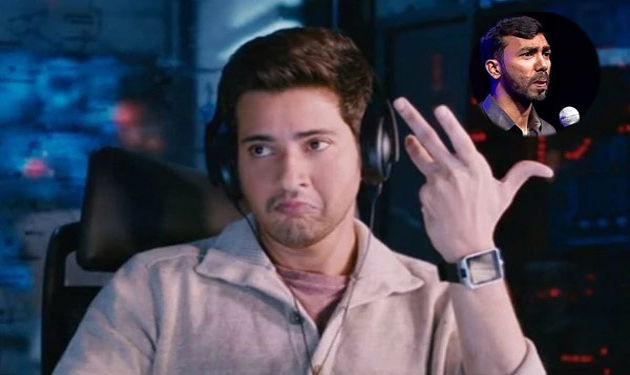 Particularly, The way he reacted over the Mahesh Fans Comments on Tom Cruise Facebook wall irked many. Mahesh Babu's Stardom and Fan Base is on par with any of the Top Stars of Tamil Cinema. Can Manoj dare to treat the Kollywood Stars in the same way? May be, Manoj is unaware of the fact that Mahesh Babu is one of the finest actors of India. He is now facing severe backlash not just from Mahesh Fans alone. Why can't these people entertain without insulting anybody?